Rapid gastric emptying (RGE) is defined as less than 30% retention at 1 h of solid meal ingestion. It is unclear whether RGE represents a separated clinical entity or part of the functional dyspepsia spectrum. To determine clinical predictors of RGE in patients presenting with dyspeptic symptoms. 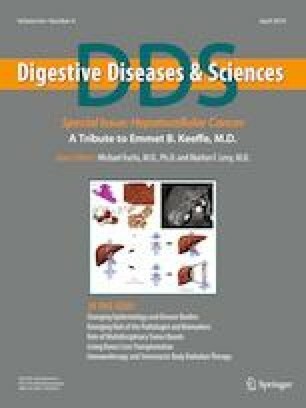 Retrospective study of patients who underwent solid Gastric Emptying Scintigraphy to evaluate dyspeptic symptoms from January 2011 to September 2012. Patients with delayed gastric emptying (> 10% gastric retention at 4 h) or prior gastric surgery were excluded. Patients with RGE were compared to those with normal gastric emptying (NGE) in a patient ratio of 1:3. Demographic data, symptoms, comorbidities, surgeries, endoscopy findings, medications, HbA1c, and TSH were analyzed. Univariate and multivariate logistic regression analyses were performed. A total of 808 patients were included, 202 patients with RGE and 606 patients with NGE. Mean gastric retention at 1 h was 18% [12.0, 24.0] and 65% [52.0, 76.0], respectively. Patient with RGE were more likely to present with nausea/vomiting (OR 2.4, p < 0.001), weight loss (OR 1.7, p = 0.008), and autonomic symptoms (OR 2.8, p = 0.022). Identified clinical predictors of RGE were older age (OR 1.08 [1.01, 1.1], p = 0.018), male gender (OR 2.0 [1.4, 2.9], p ≤ <0.001), higher BMI (OR 1.03 [1.00, 1.05], p = 0.018), diabetes (OR 1.8 [1.2, 2.7], p = 0.05), and fundoplication (OR 4.3 [2.4, 7.7], p ≤ 0.001). RGE represents a distinct population among patients presenting with dyspepsia in whom fundoplication, diabetes, and male gender were the strongest clinical predictors. RGE was significantly associated with nausea/vomiting, weight loss, and autonomic symptoms. The online version of this article ( https://doi.org/10.1007/s10620-019-05620-8) contains supplementary material, which is available to authorized users. JGC was involved in study concept and design; acquisition of data; analysis and interpretation of data; drafting of the manuscript; critical revision of the manuscript for important intellectual content. MR was involved in acquisition of data; analysis and interpretation of data; drafting of the manuscript; critical revision of the manuscript for important intellectual content. RL was involved in analysis and interpretation of data; statistical analysis. SG was involved in study concept and design; analysis and interpretation of data; critical revision of the manuscript for important intellectual content; study supervision. Lindeboom MYA, Ringers J, van Rijn PJJ, Neijenhuis P, Stokkel MPM, Masclee AAM. Gastric emptying and vagus nerve function after laparoscopic partial fundoplication. Ann Surg. 2004;240:785–790. http://www.ncbi.nlm.nih.gov/pubmed/15492559. Lorena SL, Tinois E, Hirata ES, et al. Scintigraphic study of gastric emptying and intragastric distribution of a solid meal: gender differences. Arq Gastroenterol. 37:102–106. http://www.ncbi.nlm.nih.gov/pubmed/11144011. Bennink R, Peeters M, Van den Maegdenbergh V, et al. Comparison of total and compartmental gastric emptying and antral motility between healthy men and women. Eur J Nucl Med. 1998;25:1293–1299. http://www.ncbi.nlm.nih.gov/pubmed/9724379. Moore JG, Tweedy C, Christian PE, Datz FL. Effect of age on gastric emptying of liquid–solid meals in man. Dig Dis Sci. 1983;28:340–344. http://www.ncbi.nlm.nih.gov/pubmed/6831997. Cardoso-Júnior A, Coelho LGV, Savassi-Rocha PR, et al. Gastric emptying of solids and semi-solids in morbidly obese and non-obese subjects: an assessment using the 13C-octanoic acid and 13C-acetic acid breath tests. Obes Surg. 2007;17:236–241. http://www.ncbi.nlm.nih.gov/pubmed/17476878. Bredenoord AJ, Chial HJ, Camilleri M, Mullan BP, Murray JA. Gastric accommodation and emptying in evaluation of patients with upper gastrointestinal symptoms. Clin Gastroenterol Hepatol. 2003;1:264–272. http://www.ncbi.nlm.nih.gov/pubmed/15017667. Donovan IA, Harding LK, Keighley MR, Griffin DW, Collis JL. Abnormalities of gastric emptying and pyloric reflux in uncomplicated hiatus hernia. Br J Surg. 1977;64:847–848. http://www.ncbi.nlm.nih.gov/pubmed/588981. Bagnol D, Mansour A, Akil H, Watson SJ. Cellular localization and distribution of the cloned mu and kappa opioid receptors in rat gastrointestinal tract. Neuroscience. 1997;81:579–591. http://www.ncbi.nlm.nih.gov/pubmed/9300443. Ziessman HA, Bonta D V, Goetze S, Ravich WJ. Experience with a simplified, standardized 4-hour gastric-emptying protocol. J Nucl Med. 2007;48:568–572. http://www.ncbi.nlm.nih.gov/pubmed/17401093.